Megan Ream is a 44 year old mother of two and a part time Physician’s Assistant. From the moment we met there was no question that being stagnant was not an option for her, whether it be in her career, as a mother and wife, or with her health and fitness journey. When she began to understand that plateaus and stagnation in her fitness could be avoided, she immediately starting working with a Central Athlete coach in order to create a plan to promote continuous success. Megan didn’t come to Central Athlete to compete in fitness or be the best on the playing field, she started because she wanted to see what her body was truly capable of. Her primary goal was to increase upper body strength, more specifically she wanted her first strict pull up. This carried over into deep conversation about her individual struggles with stress and lifestyle components and how tackling these factors will support her overall goal of continuous growth. She was 100% on board with creating an approach together that would support her recovery, body composition, energy levels and sleep. “I have tried a whole host of things to improve my relationship with food and I have had more consistent success with the small changes my Central Athlete coach has suggested than any other program I have ever tried”. Within weeks Megan achieved her first strict pull up and has been constantly improving in the gym ever since. Improving Megan’s upper body strength wasn’t just about seeing the numbers increase, it was about allowing her to engage in extracurricular activities with her family such as skiing, rock climbing, paddle boarding, etc. with ease and free of pain. “I am very excited that I can do 5 unbroken strict pull ups and have held a freestanding handstand for 11 seconds. More importantly, increasing upper body strength has effectively eradicated my chronic neck pain, overuse of neck muscles, and frequent headaches. That in itself has dramatically improved my quality of life”. “Central Athlete now trains my husband remotely which is a fantastic improvement in his health plan and in turn our relationship. He has been an upper level executive for 5+ years and other than a brief return to competitive swimming, this is the first time I have seen him make fitness a priority. 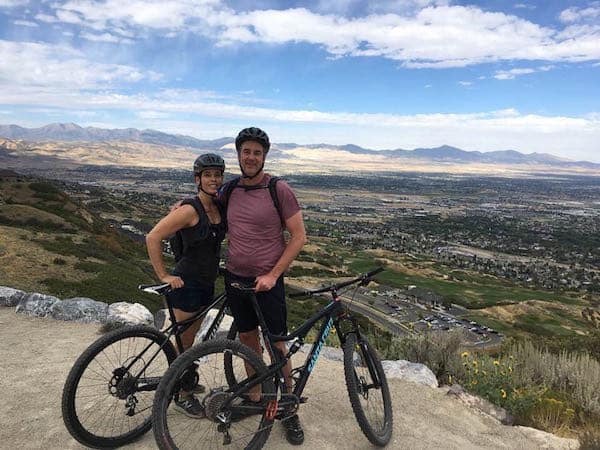 That makes our whole family happy because we want him to be around and able for a very long time.” Megan has particularly enjoyed sharing the small victories of her programming with her husband who now has a deeper understanding of Megan’s health priorities after being emerged with his own Central Athlete coach. Since starting with Central Athlete Megan has continued to see growth in all areas of her life. Stagnation is never an option for her! She has seen her strength and capabilities increase consistently inside the gym by following her unique training plan. Her decrease of neck pain and increases in energy levels and body composition improvements has made her more efficient in the workplace as a Physician’s Assistant. She is constantly striving to be the best version of herself, for her husband and her children. These relationships have been strengthened with a combined passion for improving health. Don’t take it from us coaches. Take it from Megan, who is still experiencing continuous growth in every aspect of her life! “I may be 44, but I don’t see that as a limit and Central Athlete programming has shown me that I can steadily work toward my goals. I respect that the CA staff practices what they preach, continue to expand their knowledge base, and check in with the clients to make sure it all works”.